Peter Feldmann and the Very Lonesome Boys bring years of professional experience to the stage wherever they perform. Providing lively acoustic music to a wide variety of events, including: weddings, corporate retreats, music festivals, BBQs, calf-ropings, and college concerts. Peter Feldmann and the Very Lonesome Boys perform a wide variety of music, primarily in “traditional” bluegrass style, heavily influenced by old time Appalachian string music. Their repertoire ranges from Elizabethan-era ballads to Appalachian songs and breakdowns; from country blues to modern bluegrass and beyond. 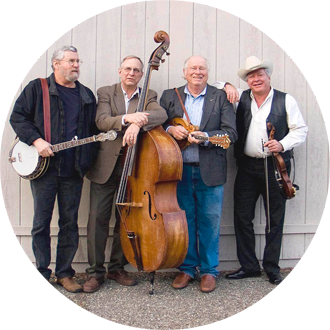 The band, widely recognized as one of the best in California, plays straight, unadulterated bluegrass, including high energy instrumentals and heartfelt singing. Their outstanding music is performed on all-acoustic instruments and can be presented with or without amplification depending on the setting of the planned event. Their sound can vary from unadulterated and exciting bluegrass music to the rich, warm blend of violin, mandolin and guitar. The group is led by Peter Feldmann, an award-winning vocalist, mandolin and guitar player, a recognized authority on the music and founder of the Santa Barbara Old Time Fiddlers’ Convention. Peter is joined by master-fiddler Blaine Sprouse, a first-rank performer in top level bluegrass bands. Both founding members of the Cache Valley Drifters and consummate, nationally-known players, David and Tom round out the group. David doubling on banjo and guitar and Tom handling the stand-up bass.